What is our memory and can science help us explain how it works? What does it have to do with the esoteric term “akashic records” and is there a way to get rid of negative subconsciously controlling stress? According to Oxford online dictionary, our memory is the faculty by which the mind stores and remembers information or simply knowledge about our past (including our thinking patterns and experiences). There is an esoteric term “Akashic records” and it seems to be closely related to what we know as memory. Akashic Records describe a collection of thoughts, events, and emotions that exist on the higher levels of consciousness. Apparently, there is no scientific evidence for the existence of the Akashic records. One questions, however, does remain, how outdated matter-based scientific paradigm can give proof or disproof to the existence of something intangible that lies on the higher levels of consciousness? Akashic Records describe a collection of thoughts, events, and emotions that exist on the higher levels of consciousness. Matter-based worldview concentrates mainly on the physical or material form which makes it very limited in regards to understanding higher levels of consciousness and the energy-informational field we are living in. There is much more to our universe than we know and perceive as reality. Until something is explained by science many people consider it magic, extrasensory ability or some kind of supernatural phenomena. New scientific field Infosomatics (based on the research of the International Institute of Social Ecology) offers a visual model that can help explain what akashic records or human body of memory (aka mental body) is. 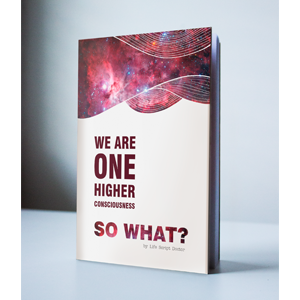 If we accept the existence of the human bodies on the higher levels of consciousness: the human aura, astral, mental, causal as well as other bodies of the higher consciousness, then a certain model can help us explain how they work. 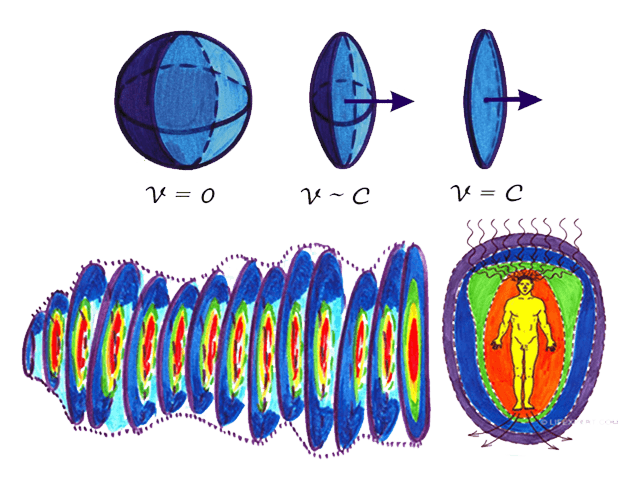 As many of you know, the human aura is an egg-shaped energy shell of a human. It has its energy centers or chakras (see “Physics of Seven Chakras and How to Balance all 7 Chakras Correctly”) that are responsible for receiving and transmitting energy as well as information that are vital for proper functioning of the human organs and body system. The current state of the human aura can be analyzed and diagnosed by people who have the ability to see it (which is a skill that can be learned through practice) as well as by certain devices. When it comes to analyzing the state of person’s energy in the past, the principles of relativity introduced by Albert Einstein can be of a great asset. Everything is relative and for an outside non-accelerating observer the human physical body, as any material object, is a set of energy-informational particles that is moving in space and time with a terminal speed “C” (see the picture below). An object that is moving in space with a speed “C“ will lose its volume in the direction of its manifestational axis (an egg-shaped sphere will turn into a disk). By adding the concept of time and movement in space to the model of the human aura we get the so-called body of memory, mental body or personal Akashic record. (see the video on the bottom of the page or the picture below). Physics behind akashic records, mental body or body of memory. 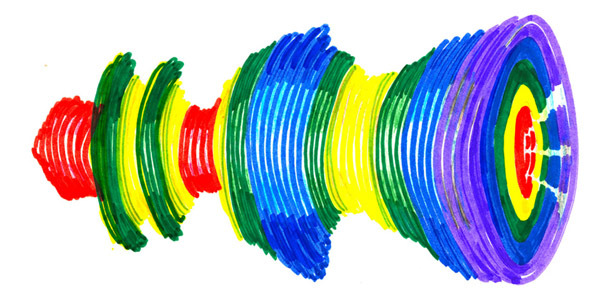 A sphere (the human aura) as an object that is moving in space with a terminal speed will take a form of a disk for an observer and will hold the information about person’s energy state at a given quantum of time and space (image is the courtesy of the International Institute of Social Ecology). The model above offers a way to visualize human life as a constantly moving tube that is created in space and time on the higher levels of consciousness. This “tube” holds the information in which state your energy shell or the human aura was at any given point of time in the past. It holds the memories of all of your emotions, experiences and events starting from the date of birth – the point in time and space when you have received the initiation to realize your full potential (see “How Knowing Your Cosmic Address Can Help to Realize Your Potential). The bumps and holes on the surface of the body of memory symbolize the stress in the energy flow that you have experienced in the past. Using a certain self-guided meditation or visualization techniques it is possible to go back in time and pinpoint the subconsciously controlling stress on your personal “akashic record”. If you have accumulated a lot of subconsciously controlling stresses throughout life, you might feel lack of proper energy flow in the point of “here and now” which often can lead to problems with health as well as other areas of life. Personal Akashic record, body of memory or mental body. Red part of the mental body shows lack of energy due to the negative influence of undischarged stress (image is the courtesy of the International Institute of Social Ecology). After the point in time when the stress was originated is identified it can be discharged with self-guided meditation/visualization techniques (e.g. “Powerful Visualization Meditation Technique – DNA Tree of Energy Flow“) and it will no longer have a negative effect on the current state of person’s energy. When the stress is discharged and the blockage on the mental body is removed, the person gets back the energy that he or she have lost in the past. The similar concept is behind NLP sessions and other modalities when you are asked to remember the event back in time when you were a kid and a certain stressful situation have happened. You are then asked to comfort your “child self” and tell yourself in the past that everything is going to turn out just fine. The whole process is often carried out in the form of a guided meditation. Thus, when you lack energy today it does not necessarily indicate that you need to find a new outside source of energy. A much better long-term solution would be to first get rid of the negative influence caused by the stress that you have in your memories or personal Akashic record. It is a very rare case when your mind, including your subconscious mind, wants to voluntarily step out of its current comfort zone (even when the true reality does not feel so comfortable). You need to use your will and know how to direct your energy in order to change your life for the better. If you don’t do anything, eventually, the energy field will force you to move forward and evolve using even more stressful situations. With time, those stresses can accumulate and have a destructive, if not lethal, influence on the state of your energy shell and life itself. Higher consciousness, or simply Nature, did intend for you to be happy, you just need to see what is in the way of your dreams and learn how to get rid of it. Below you can find a clip from one of the Life Script Doctor webinars. For more advanced practical knowledge or personal guidance see shop/services section of the website and feel free to contact Life Script Doctor with any related questions.